In his New York Times bestselling chronicle of military life, Anthony Swofford weaves his experiences in war with vivid accounts of boot camp, reflections on the marines, and remembrances of battles with lovers and family. When the U.S. Marines—or “jarheads”—were sent to Saudi Arabia in 1990 for the Gulf War, Anthony Swofford was there. He lived in sand for six months; he was punished by boredom and fear; he considered suicide, pulled a gun on a fellow marine, and was targeted by both enemy and friendly fire. As engagement with the Iraqis drew near, he was forced to consider what it means to be an American, a soldier, a son of a soldier, and a man. "A bayonet in the eye...brutal and unforgettable." 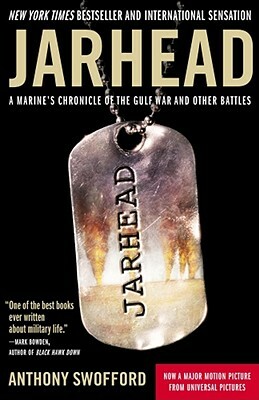 "A searing contribution to the literature of combat." "A brutally honest memoir...gut-wrenching frontline reportage."